In 2012 Myryah Irby and her husband Kevin purchased a small converted cabin in the woods of upstate New York. Built in the late 70s, it was structurally sound and full of light, but outdated, and too small for a family of four plus weekend houseguests. An addition and renovation was in order. Myryah Irby: The main issue was space. 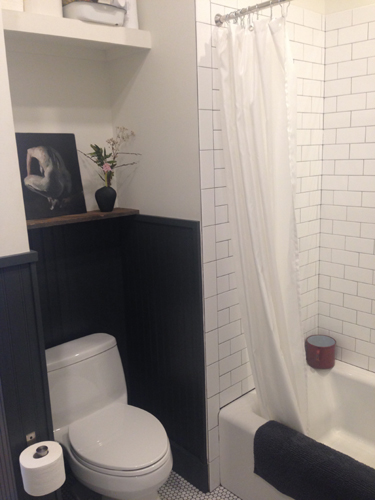 The house had good bones, high ceilings, and lots of light, but only two bedrooms — one of them tiny — and one really weird bathroom. Also there was only one small closet in the entire house. We needed at least three bedrooms and an office, along with a second bathroom with a soaking tub. We wanted the house to be big enough so that we could invite guests up for the weekend without having everyone on top of each other. MI: Rustic, eclectic mid-century modern. I’m a minimalist; my husband is not. He really likes his stuff, so we have to compromise all the time. Design-wise I lean towards simplicity; he is a risk taker and experimenter. While adding onto and renovating this house many of our discussions ended with me either saying, “no, too cluttery,” or “no, too complicated,” or just “nope.” I was a little bit of a bully, I'll admit, because I had a very specific idea of how I wanted the house to feel — unfussy, serene — and a mural on the wall, for example, or interior doors painted all different colors, well, those suggestions fell into the “nope” category. For most of the important design elements we were on the same page though. High ceilings, open floor plan, lots of windows and skylights. 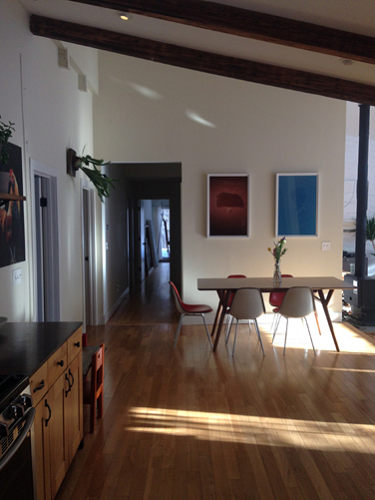 The goal was airy and modern, like the loft we share in Brooklyn, but more refined and rustic. Our taste in art, materials, and furniture is pretty well aligned however; my husband just likes more of it. We both like old hardwoods, walnut is a favorite, heavy metals like iron and bronze, and lots of white and grey with pops of color. MI: Put together an inspiration board. This is easy to do on Pinterest. Ours included interior design photos, furniture, lighting, materials, fixtures, just whatever inspired us, even if it was something we knew we couldn’t afford, we pinned it anyway to help inform our design choices. 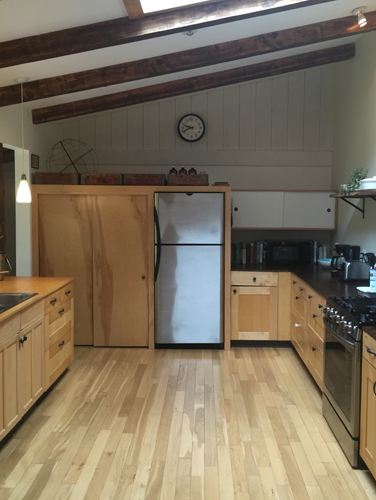 MI: That’s a toss-up between a nice, open kitchen with lots of counter space — we love to cook and entertain — and a soaking tub. I’d spend half of my day in the tub if I could get away with it. The master bath was designed with the beautiful view in mind. Our house is in the middle of five wooded acres, we wanted it to feel like an oversized tree house. 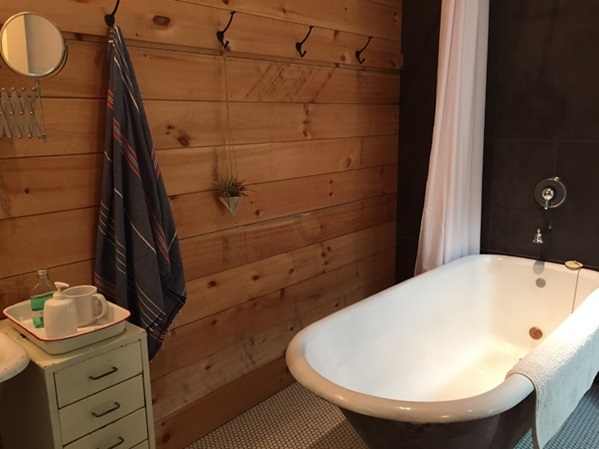 We kept sightlines in mind when building decks and positioning windows, skylights, sliding doors, and, importantly, the bathtub. It’s situated so that the bather has a nice view across the master bedroom out onto the property. I always bring something to read in the tub, but more often than not I end up just looking out at the trees. IC: Did you use a contractor, or tackle the renovation yourself? MI: We had a great contractor who built the addition, though he also did some of the work on the existing part of the house, like tearing out the wonderful brown shag carpet and installing wood floors. There wasn’t a whole lot of construction work necessary in the existing part of the house beyond moving a doorwall, adding a wood burning stove, and replacing old skylights. Most of the renovations to the original house were cosmetic, and we handled those ourselves. 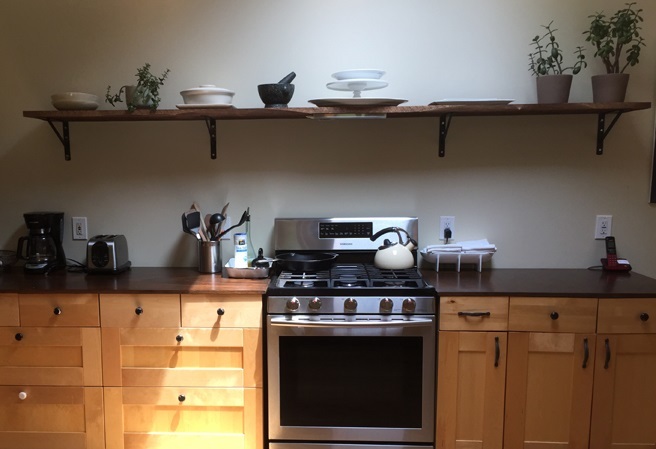 We painted, stripped beams, and built shelves, closets, and decks. We’re saving our pennies so we can pour our own concrete countertops at some point. MI: Staying on budget. We had to get really creative with certain elements so that we could keep the most important details in our design. We saved money by scouring resale shops, and using elbow grease. 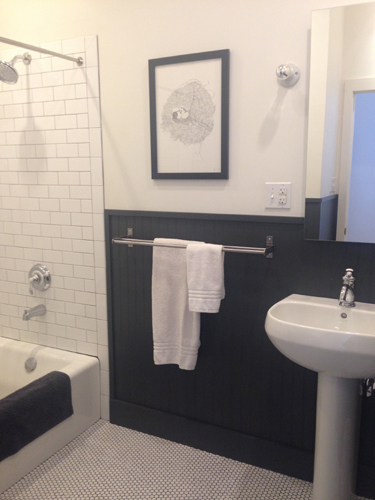 For instance, we bought a bathroom sink and a huge clawfoot tub for a few hundred dollars. 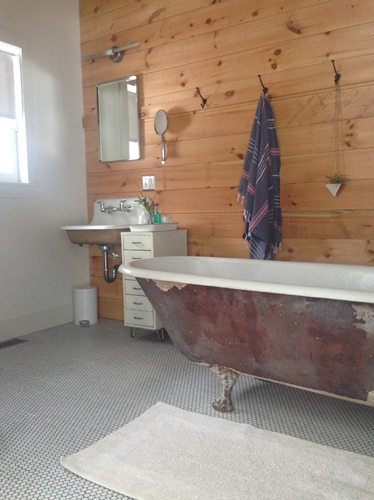 My husband spent a month stripping the lead paint off the tub before handing it over to our contractor. These savings allowed us to splurge on skylights and extra windows. There were a few times during budgeting talks where we thought we’d have to lose the skylight in the master bedroom, but I was determined to make it work, and thank goodness it did. The midday light in that room is dreamy, and there’s nothing better than drifting off to sleep while gazing at the stars. MI: The design phase: creating the floor plan and fidgeting with it; moving the toilet and sink around; widening the hallway; etc. All of that was super fun. We drew up the plans ourselves (my husband is a wizard with that kind of stuff) then had an architect review and stamp them for a fraction of the cost. This isn’t standard procedure, and we’re lucky our contractor agreed to it because it saved us a lot of money.